Lots of classic boots under £100! I have a pair of ugg slippers on at this very moment. thanks OP that's mine ordered - cheapest Ive seen them! 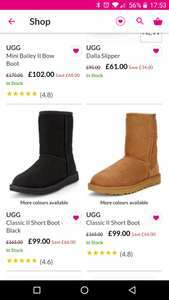 My original post only mentioned that lots of ugg boots were in the sale. A moderator decided to add the information about children's boots. Hey Rochelle, or anyone who knows, are Ugg insoles worth buying? I bought cheapo ones from ebay a while back but I've found they wear away quite quickly (maybe I'm quite heavy-footed, I don't know). Doesn't help that the Uggs I have won't let me remove the original sole, which maybe causes extra friction? Uggs are wonderfully cosy and comfy but the best compromise is the real leather ones for waterproof-ness (which is what I have). Hey Rochelle, or anyone who knows, are Ugg insoles worth buying? I bought …Hey Rochelle, or anyone who knows, are Ugg insoles worth buying? I bought cheapo ones from ebay a while back but I've found they wear away quite quickly (maybe I'm quite heavy-footed, I don't know).Doesn't help that the Uggs I have won't let me remove the original sole, which maybe causes extra friction?Uggs are wonderfully cosy and comfy but the best compromise is the real leather ones for waterproof-ness (which is what I have). The ugg insoles are definitely worth the money. 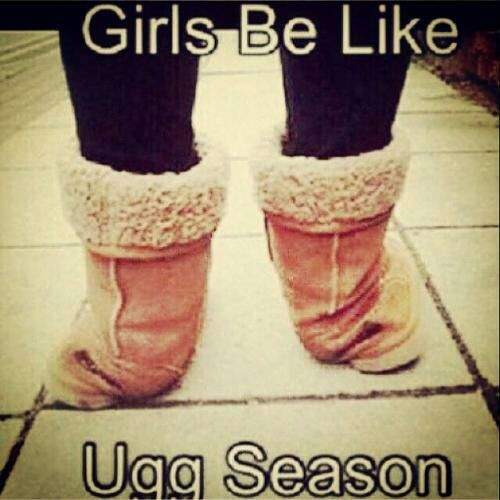 I've had a pair of cheapo ones in the past and the ugg ones are 100% better (they make the cheap ones seem like paper). Maybe see if a cobbler can remove the insole for a reasonable price, that way you can use the new ones without compromising comfort. I have "stiff leather" classic style Uggs and had to go up a size to be able to put them on! I'm a size 7 in just about everything (apart from heels) but the leather ones were tough to squeeze into!! Failed to see why it's cold? Has anyone posted any counter-links showing lower prices for same brand that I missed? Postman's just handed me my Ugg inner soles - had it for delivery to store - unless I've mucked up somewhere but I've still only been charged £10. Been wanting these for a while but thought paying £18-20 was a bit much. Thanks OP, and Rochelle. Deal posting newbie! This is Tammy.Lou first deal post. Help out by leaving a posting tip or just to show your appreciation for their contribution.